Israeli author Yoav Blum’s debut novel (published in 2011) and first novel to be translated into English is a metaphysical love story. It takes as its premise the forces behind the every day. But it imbeds these forces with a deep humanity. Guy is a coincidence maker. His job is to arrange the world so that certain events take place. He is given missions to produce certain outcomes. He has the ability then to map out exactly how small and large events are going to happen and then nudge the variables to produce results. Missions come as an envelope under his door and he plans all of the interconnecting strands of his mission as a map on the wall of his apartment. Guy’s expertise is in bringing two people together, creating relationships out of a web of seeming coincidence and happenstance. But he is part of a much bigger and deeper organisation and it is possible that these missions are just small parts of a much bigger plan. Guy works with two other new coincidence makers – Emily and Eric. Emily is in love with Guy but cannot make him see her. Guy is still mourning the loss of his love from his previous metaphysical job as an imaginary friend. As an imaginary friend he would appear to a person, usually a child, in the form that they imagined and give them advice. In some ways, the concept of the imaginary friend for hire is a more cogent one than the job of coincidence maker. Blum builds tension nicely and the twists, while a little predictable (this is a romance after all) are well handled. The sections detailing the life of imaginary friends is also clever. The art and science of coincidence making is deeply and amusingly explored, as Blum includes faux scholarly articles and training manuals in amongst the main text. The only thing missing from this though is a larger sense of purpose behind the work or even the concept of coincidence making. It is unclear, even with all of the commentary, why coincidence makers exist at all, what the aim is of manipulating the world for specific outcomes. Some deeper plan is hinted at but never explored which leaves the main conceit of the book, that coincidence makers exist and manipulate reality, existing for its own storytelling sake. 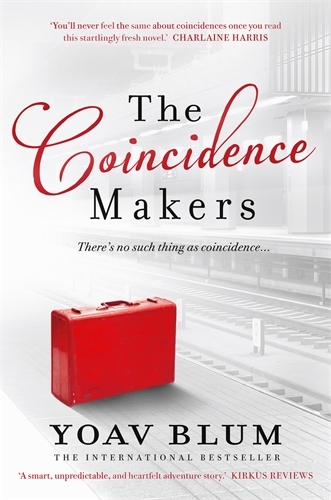 But putting his quibble aside and just going with it, The Coincidence Makers is a lot of fun, is full of engaging and endearing characters and (with just a small nod to Harry Potter) highly original.